Images of the so-called immortal poets kasen 歌仙, distinguished historical poets of waka 和歌 (Japanese 31 syllable poetry) before the 13c. Usually, the poet's name, a short biography, and a representative poem are written next to his portrait. Kasen-e probably originate from the idealized portraits of Kakinomoto no Hitomaro 柿本人麿 (act. late 7c), who was revered as the patron saint of poetry in the Heian period. Documents record that portraits of Kakinomoto no Hitomaro were displayed at poetry parties dedicated to him during the latter half of the 11c. See *Hitomarozou 人麿像. The images on the illustrated handscroll of The Thirty-six Immortal Poets, Sanjuurokkasen emaki 三十六歌仙絵巻 were selected and anthologized by Fujiwara no Kintou 藤原公任 (966-1041), a leading poet of the early 11c. The earliest extant examples, which date from the mid 13c, are the Satake 佐竹 version (named after the Satake family which owned the work until 1919) and the Agedatami 上畳 version (raised tatami-mat, so termed after the characteristic mats on which the seated poets are depicted). Despite the fact that these 'portraits' are derived from the imagination of the artists, a wide variety of facial expression is used to convey the personalities ascribed to the poets. Kasen-e developed within the naturalistic tradition of *nise-e 似絵 in the Kamakura period. 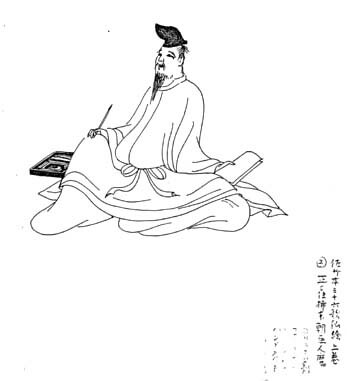 Paintings of Immortal Poets, not necessarily based on Kintou's collection, were made throughout the middle ages. In the Edo period, *Rinpa 琳派 and literati bunjin 文人 artists painted this theme in a decorative or sometimes charicature-like manner in various media, including screens. The theme was also used for votive tablets at Shinto shrines. Another set of kasen-e is based on an anthology of an imaginary poetry contest pairing one hundred ancient and contemporary poets entitled Jidaifudou utaawase 時代不同歌合, compiled by the ex-Emperor Gotoba 後鳥羽 (1180-1239) in the early 13c. Most of the extant examples of this theme date from the 14c and later. Typically Jidaifudou utaawase are handscrolls employing the *hakubyou 白描 technique. See *utaawase-e 歌合絵. Portraits of one hundred famous poets popular in the Edo period, however, were based on a different source: Single Poems by 100 Poets *Hyakunin isshu 百人一首, a long-neglected anthology by Fujiwara no Teika 藤原定家 (also known as Sadaie, 1162-1241). The Hyakunin isshu often appear on 100 playing cards used in a game. Each card depicts a poet with a representative poem. The game is still played today, especially at the New Year's holiday.